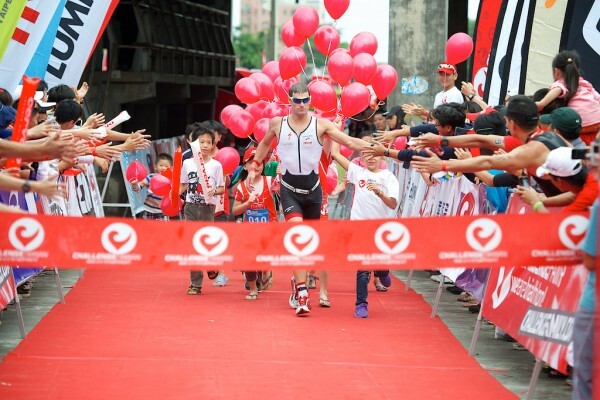 Reigning Challenge Wanaka champion, Dylan McNeice, has again made his mark on the international triathlon circuit as he took his second major title in only his second long distance race at this weekend’s Challenge Taiwan. Meanwhile two-time Challenge Wanaka champion, Belinda Granger (AUS), won the women’s race, claiming her 15th long distance victory in the process. His two from two win proved that his victory at January’s Challenge Wanaka was no fluke as once he again he led from start to finish. The 27-year-old asserted himself early on, leading a competitive field by over three minutes out of the swim in 47:00 and never relinquishing his lead, taking the title in 8:16:21. McNiece’s closest rival out of the water was Todd Skipworth (AUS), an Olympic rower-turned-triathlete and also a rookie in the professional long course ranks. Skipworth leapfrogged between second and third place throughout the bike course with Georg Potrebitsch (GER), eventually reaching T2 just ahead of the German with the fastest bike split of the day in 4:28:40. Within a few kilometers on the run Potrebistch managed to pull ahead and maintained his position to the finish line taking second in 8:27:06. Skipworth would ultimately drop back to fifth, passed by both Fredrik Croneborg (SWE) and Petr Vabrousek (CZE) who crossed the line in third and fourth respectively. But while Vabrousek’s finish marked an historic 125th long course race for the Czech athlete, Croneborg’s performance was equally remarkable. The smiling Swede was a swift yet silent achiever, working his way steadily through the men’s field and capping his stellar day with a race best run split of 2:52:33. Also of note in the men’s race was Guy Crawford (NZL) who, despite a debilitating mechanical issue on the bike fought hard to hold onto sixth place. The women’s race featured an equally dominant champion, with Challenge Family ambassador Belinda Granger (AUS) claiming her 15th title in 47 career long course finishes. Fresh off of a two-week training camp in Phuket, Granger initially seemed too far in arrears to set the first women’s course record in Taitung. She exited the water 6:23 back from notably strong swimmer Hillary Biscay (USA) and 4:50 from fellow Australian Kate Bevilaqua. But the swim deficit only served to light a stronger than usual fire underneath the already powerful cyclist, and by T2 Granger’s 4:55:34 bike split propelled her to the women’s lead. Granger’s ride, followed by an equally strong run, built a comfortable buffer over Biscay, and she posting a winning time of 9:23:15. Biscay, who boasts an even more impressive long course resume with 59 finishes to her credit, held tough on both the bike and the run, finishing in 9:37:40 for second place. Kate Bevilaqua rounded out the women’s podium, despite struggling with stomach issues throughout the bike leg.